Hotel Abaco Florence - Home - Cheap Hotel in Florence - Budget Hotel near Santa Maria Novella in Florence! A Budget Hotel with a Difference! Welcome to the budget Hotel Abaco, cheap hotel in Florence, cradle of the renaissance! At the Hotel Abaco on Via dei Banchi, you’ll be surrounded by renaissance charm both inside and outside! Dating back to the 16th century, the bygone glory of Florence is alive and well inside this charming historical building. Renaissance Florence in your Hotel! Owned and run by an aficionado of the great renaissance that began right here in Florence, the Hotel Abaco’s internal decor is distinctively period Florentine renaissance, with oak beamed ceilings, antique furniture and prints of precious masterpieces adorning every wall. Each of the seven rooms at the Hotel Abaco is named after one of the great artists, sculptors or architects of renaissance Florence. At the Abaco cheap hotel in Florence each of our seven rooms is named after one of the great masters of the renaissance period, which began right here in Florence in the 14th century: Caravaggio, Rosso Fiorentino, Leonardo, Giotto, Raffaello, Botticelli and Michelangelo. Also here at our friendly hotel in Florence you’ll find a warm and welcoming atmosphere, attentive customer service and free Wi-Fi! Thanks to the excellent central location of the Hotel Abaco Florence, guests here can enjoy cheap accommodation while still being in the very heart of everything. Just 400m from Stazione Santa Maria Novella and even less from the Duomo, the budget Hotel Abaco Florence allows you to base yourself in the very centre of the city. 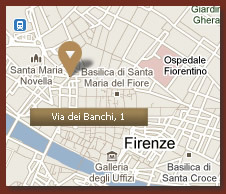 Check out the fantastic location of our city centre hotel in Florence here! FAQs - Find out about policies and procedures at the Hotel Abaco Florence. Our cheap hotel in Florence offers a great value budget hotel option in the very centre of the city. Online Booking - No need to call or wait for an email response, book your cheap hotel in Florence now with our online system. Cheap Hotel Rooms in Florence - See a breakdown of our seven rooms, name by name, and the facilities and services included with each. At our friendly hotel in Florence you’ll find a practical package of useful services and facilities - click here to read more. If all you need is a city centre hotel in Florence at the lowest possible rates, then check out our great special offers and low low nightly rates! For queries regarding procedures and policies at the Hotel Abaco Florence, see our Cheap Rooms Florence FAQs.